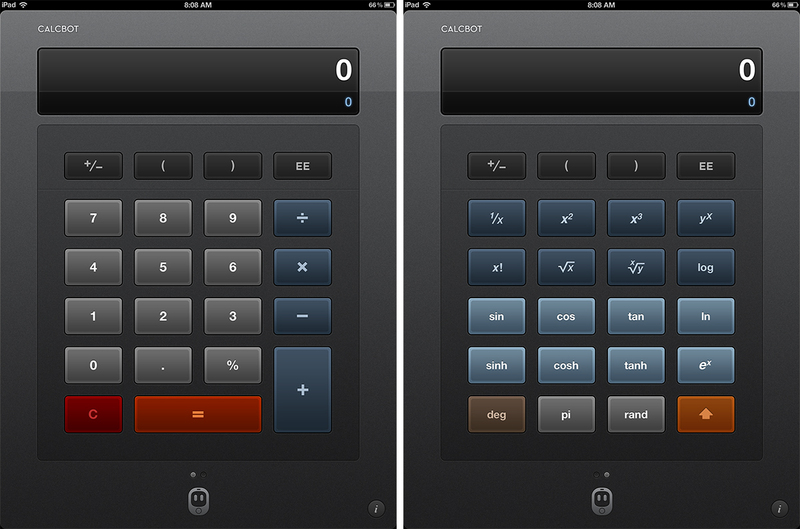 The Calculator app is one of those iPhone apps that didn't make it's way onto the iPad. It's a shame, because a lot of people, including students, travelers, and home book keepers would get a lot of use out of it. The most popular type of calculator is a scientific calculator -- it can do more than the basic operations (adding, subtracting, multiplying, and dividing), but isn't as different in approach as an RPN (reverse Polish notation) or as advanced as a graphing calculator or CAS (computer algebra system). 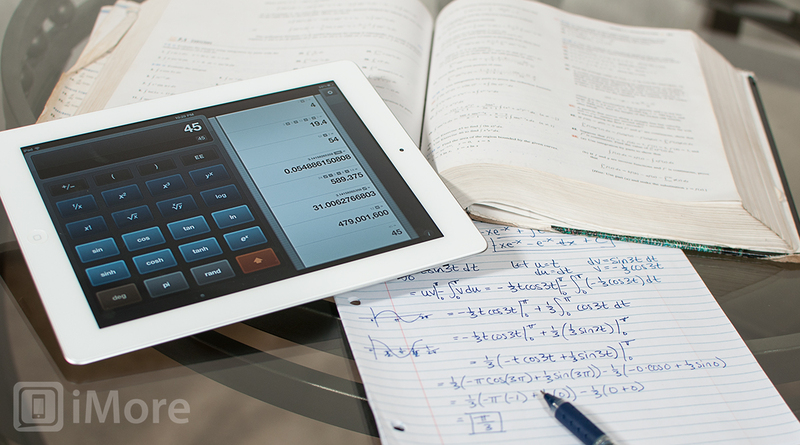 So which iPad app is the best scientific calculator? Calcbot by Tapbots. One of the great features of Calcbot is that it has large buttons, making it very easy to make entries. In portrait mode, the calculator takes up the whole screen. Along the top is the output screen of the calculator. Under that, you'll find the positive/negative, parentheses, and EE buttons. These are the elements that remain static. The area of the calculator that contains all the numbers and operations is scrollable. Swiping to the left will reveal all the scientific functions. The up-arrow button on the scientific page will replace the trigonometic functions with their inverses, and the logarithm and exponential functions that are base e change to base 2. Visually, these are all the buttons that are light blue in color. As you press buttons on the calculator, their symbols will appear in small, light blue letters at the bottom of the calculator's screen. This is extremely helpful for keeping track of which button you've pressed last. The tracking will reset every time you press enter, when it then gets transferred to the tape. To see the tape, rotate your iPad to landscape. The calculator will become slightly smaller and the tape will slide in from the right. The tape keeps track of all your calculations, including all the buttons that were pressed to get the results. Holding your finger down on an entry pops up a menu to either Use Result, Use Expression, Copy, Send as Email, or Delete. Using the result or expression will automatically add your choice into the calculator. 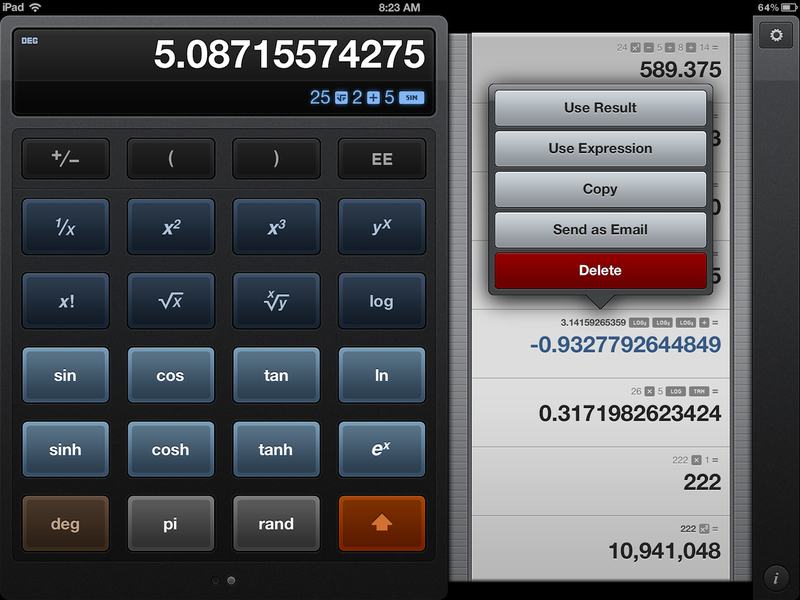 You can also paste into the screen of the calculator or into another app. Calcbot by Tapbots has been my favorite calculator on both the iPhone and iPad for quite some time. It does what I need and does it well. Unfortunately for students, Calcbot likely will not be able to replace a physical calculator because most teachers will not allow the use of iPads during exams.